We are happy to announce that Absolute Pro-formance is moving our shop. We will be moving to 3306C Baltimore Blvd., Finksburg, MD 21048. We will be having a Grand Opening party on Sat. Aug 9th from 11-5. 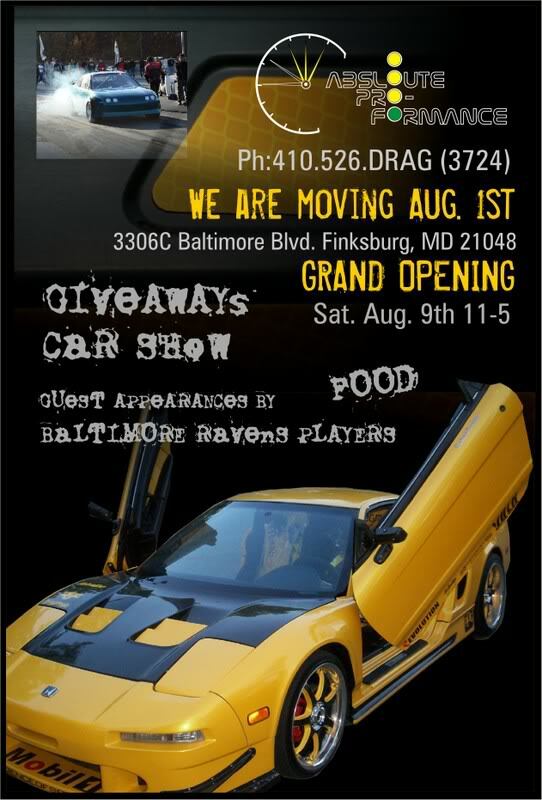 There will be food, car show, giveaways, Ravens players and their cars. We would like to get a meet together. Best of all everything is free. It is on Route 140 just over the Carroll County line. We will have some of our race cars on display as well as a bunch of show cars. Please stop in and check us out! We have sucessfully moved into the new shop. The event is going to be pretty sick as we have 100+ cars showing up, food catered by HOOTERS, and now a DYNO. Tomorrow is the big day, hope to see alot of you here. Expecting 150+ cars for tomorrow.